I used to be terrified of bees. I’m not sure why, though, because I don’t remember ever having been stung as a child. Over the years, however, I’ve grown more comfortable around them and don’t shudder each time one flies near. I’ve spent a lot of time this spring traversing fields of native grasses with my volunteer work for the Smithsonian, so I’ve grown even more comfortable among these incredible insects. 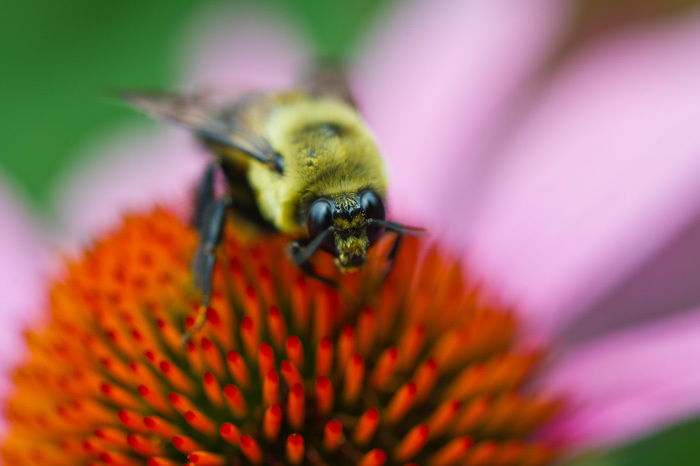 Today, I took advantage of my new-found bravery (and their obvious singular focus on a beautiful garden of cone flowers) to get up close and personal. This bee paused to clean his face, and I like to think he was trying just has hard to focus on me as I was on him. Bumble bees are good critters that won’t sting. What do you do for Natl. Geo??? How exciting it will be when your byline is in a magazine!!! Actually, it’s the Smithsonian. I volunteered for a research project this spring in which I identified and documented bird species. Not NatGeo yet! Maybe someday! i love the picture. but how do get the bee to stay there long enough to take a picture? ?